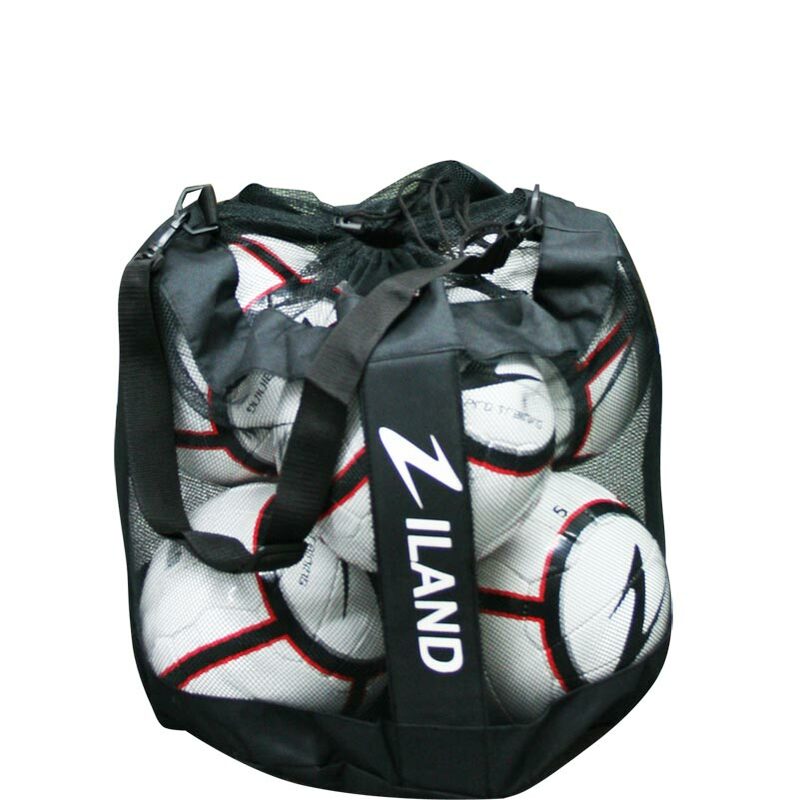 The Ziland Ball Bag is the perfect holdall for your teams footballs or rugby balls when going to training sessions or matches. Cord system for quick and secure closure. Ideal for me to transport a mixture of footballs, netballs and basketballs for primary school sport. Lightweight and fairly strong. Mesh allows the balls to dry off without the need to take them out of the bag. Very pleased with the product. Even though it's full of balls and very heavy it's very durable. I have 20 Size 3 football's that easily fit into this bag, with lots more space. The mesh is great and helps it all dry fast when wet. Good Product but not the best to carry as the strap is placed across the top not the side. Would still recommend !!! Brilliant size (6 ball) handy all round. Waterproof base is good. adjustable strap. This ball bag is great. I use it to transport all my small pilates/yoga balls. Can easily get 15 balls in. Good strong band with sturdy strap and a toggle to open/close the string at the top. Looks good to. Have bought a number of these recently for our soccer centre. Generally good bags although the side of one strap came off the bag, not sure if it was mishandled or faulty. However would purchase again. The bag does exactly what it is meant to, my only draw back is, lucky im 6ft as when the bag is full a shorter person would struggle to carry the bag without dragging along the floor. This is a good strong bag that easily fits 25 size 3 ball in it. Strong panels support bag sides and add strength. The bag is good, large and spacious which makes it easy to carry twenty balls collectively to and from training. We fill our bag with with 4 balls, about 10 bibs, 4 gloves and a pump with needle that dangerously pokes out of the netting at times but this is a risk we are willing to take! All in all it holds these things quite easily and it is very comfortable to carry. Newitts also delivered quickly; no problems. Bought bag as I was buying a heap of footballs and it is good size. Decently priced too and quality is good. Lack of shoulder straps could be an issue so think about how much you need to carry. This football bag is really good, it has strong netting and can easily hold 20 footballs. The strap makes it easy to carry and comfortable. 3 out of 5 Great Value .. but ..
Can't complain at the price, £6 for a 6 ball bag, can fit some bibs and some gloves in as well so great for storage. The only draw back for me is the quality of the netting, quite a few areas now where its splitting, so eventually it will probably split completely thus rending the bag unusable unless repaired. Can't complain for the price though, build quality bit suspect mind! Happy to endorse the Ziland Ball bag. Holds up to 6 footballs for easy storage and portability. Price, delivery and service were superb. I bought the 6 ball bag to carry the warm up kit for match day, I have a stack of cones, 4 balls and some bibs in there and it is not to heavy or to full. The only issue I have had is the D ring on the bag broke within 2 weeks of having the bag. I have managed to construct a new one out of an old wire hanger and have taped up the other one to make it more sturdy. Just be careful with it and it will be fine. This is a very sturdy and rugged bag at a fraction of the cost of other brands. Does what it says on the tin! 5 out of 5 Smashing bit of kit! I bought 3 of these bags to try to organise the various balls my boys have and can never find! They are good value and hang up by the back door. It's easy to see what's in each bag and by hanging them up they stay nice and dry. Wish I'd bought them years ago!